Located in Royat, just 5 km from Clermont Ferrand, Le Chatel offers a restaurant, terrace and luggage storage. The hotel is only 12 km from Vulcania Discovery Park. All rooms are decorated in a unique style and they feature a flat-screen TV. The private bathroom is complete with a shower. A buffet breakfast is available each morning at Le Chatel. 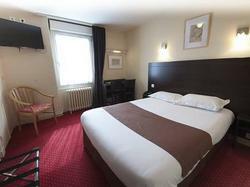 Guests can also dine in the on-site restaurant or find a choice of cuisine in the centre of Clermont Ferrand. Royatonic Thermal Resort is 200 metres away, the Olympic Swimming Pool in Chamalières is 1.6 km away and the Arténium de Ceyrat is 5 km away. Puy de Dôme Volcano is 9 km from the hotel. Additional features include an elevator, free Wi-Fi access and free private parking on site. Please note that the restaurant is open every day from April to October, and from Monday to Thursday from November to March. This room features a flat-screen TV and a private bathroom with a shower. This room is composed of a double bedroom and a living room which can accommodate 2 children. The bedroom has a flat-screen TV and a private bathroom equipped with either a bath or shower. This more spacious room features a flat-screen TV and a private bathroom with a shower.